In this interview, Richard Polt talks about collecting typewriters, from the early experimental machines of the 1890s to more modern postwar portables. Polt, who lives in Cincinnati and teaches philosophy at Xavier University, can be reached through his website, The Classic Typewriter Page, which is a member of our Hall of Fame. I started to get interested in typewriters around age 12. My dad and I stopped at a garage sale and he bought me this typewriter from the 1930s, and I was just learning to type at the time. It’s a Remington Noiseless Portable, and it has very lovely Art Deco lines. I used it for about 10 years for most of my writing work and picked up a couple of similar machines along the way. I loved that machine. But I didn’t get seriously addicted to typewriters until 1994 – that’s when I ran across a reference to somebody who published a newsletter about typewriter collecting. His name was Paul Lippman. He’s deceased now, but he wrote a book called American Typewriters: A Collector’s Encyclopedia. That just opened my eyes to the weird and wonderful variety of typewriters that were made in the 19th century, and that’s what really got me excited. Collectors Weekly: Do you focus mostly on typewriters from the 19th century? Polt: Not really. I have them ranging all the way from the 1880s to the 1960s. 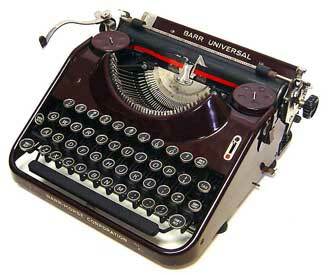 The heyday of the typewriter was from about 1890 to 1980. They were standard equipment for 90 years. It’s tough to say when the typewriter was invented. The first one that we know to have existed and worked is from the early 1800s, 1808. But it wasn’t commercially produced; it was just one machine. There were quite a few other inventors later in the 19th century, and then in 1870, a machine called the writing ball was invented in Denmark. It looks like a pincushion where you push down on the keys and the paper is right underneath the pincushion. It was very well made, but not many were sold. The Underwood, which came out in 1895, turned out to be the most influential typewriter of all because it solved the problem of visible writing in a good way. The more influential machine, which a lot of people think of as the first typewriter, was produced in 1873, and called the Sholes & Glidden. 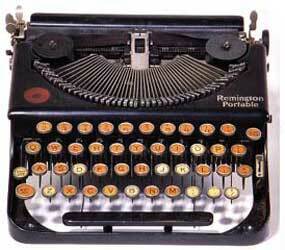 It introduced the “QWERTY” keyboard, and was made by the Remington Arms Company. The later models they made were called Remington, and they became a major manufacturer. In the 1870s, this was a strange luxury item that not too many people found useful. In the 1880s a few more designs came on the market, and people started to get interested. And in the 1890s, suddenly it was a machine that every office had to have. So that’s the really interesting time for collectors because there are so many different designs. People were experimenting and they couldn’t infringe on each other’s patents, so they had to be pretty original. And of course, naturally, a lot of those designs failed in the marketplace. Now it’s interesting to look for them. Back then, there were a lot of issues that had to be resolved: were typewriters going to have keyboards? Would you select letters on a dial or an index of some kind? If they had keyboards, would they have shift keys or would they have separate keys for lowercase and uppercase letters? Typewriters were produced with all these different arrangements. And of course there was the issue of how to arrange the keys, because QWERTY, everybody realized, was not the most efficient arrangement. Another big issue was how to make what you were typing visible, because with the Sholes & Glidden typewriter, you couldn’t actually see what you had typed without raising up the carriage to look; it typed on the bottom of the carriage. Inventors struggled to come up with a different arrangement that would give you instantly visible writing. Over the subsequent 80 years, there have been many different types of typewriters, including office typewriters and portable typewriters. Some of the office machines are very heavy, and the portable ones obviously are not. As the 20th century went on, the portable ones got more popular. 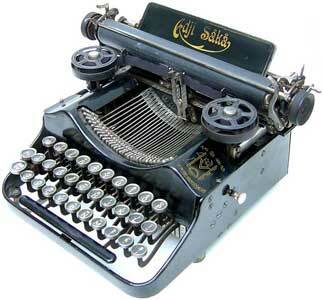 A lot of people would have typewriters in the office and a portable at home too, which they could carry on travels. Some were developed to be very flat and light like laptops. The Underwood, which came out in 1895, turned out to be the most influential typewriter of all because it solved the problem of visible writing in a good way. It made a lot of other choices that were imitated by later manufacturers. It has four rows of keys on the keyboard, a shift key, and it’s a front stroke. In other words, the type bars hit the front of the platen, which is the rubber roller. Inking is by ribbon. That machine set the standard for almost all typewriters until 1960 when the IBM Selectric was introduced. The Underwood #5, which was made for most of the first half of the 20th century, was found almost everywhere, and they’re so very easy to find today. They were made by the millions, and you found them in businesses, newsrooms, government agencies, and homes. By contrast, some of the experimental typewriters of the 1890s are in retrospect just ridiculous. For instance there’s one called the Duplex where you could type two letters at once. Your left hand and right hand would have to type two different letters simultaneously, and there were separate keyboards for left and right hands. So it’s a huge number of keys and you have to do these mental gymnastics to type on it. But they didn’t really know that until they put it on the market and nobody could use it. Collectors Weekly: What were some of the most popular typewriter models? Polt: The American makers Remington, Royal, Underwood, and Smith Corona and the German Olympia. Those were probably the most popular machines, but for people who are just starting to collect, it’s worth mentioning that those are all pretty conventional-looking typewriters. There are also some early odd-looking typewriters that are still pretty common today because they were pretty popular in the 1890s and the early 20th century. That would include Hammond and Oliver and Blickensderfer. There are a lot of subgroups of typewriter collectors. Some of the older collectors especially are just interested in the very early and rare models from the 19th century, and they won’t touch anything that looks conventional or is recent. But in the case of most of those early machines, no more than a few thousand of them were made, and that obviously gets quite expensive. Other people are just interested in a variety of designs, whether they’re common or not. A lot of people like portables. Recently, especially thanks to the efforts of Will Davis, who has a great website, people have gotten more interested in post-World War II typewriters, especially postwar portables. Between prewar and postwar typewriters, there are stylistic differences and differences in material; the postwar typewriters used more plastic. Until recently they were just seen as old stuff, not antiques, but now people are starting to appreciate them. One 20th century model that’s pretty eye-catching – and pretty rare in the U.S. – is called the Rooy. It was made in France, and it’s a real laptop. It fits in a case that’s attached to it. When the case is closed, it’s about 1 1/2 inches high. Another interesting make that’s pretty common in Germany but again hard to find in the U.S. is Voss. Those were really well made German typewriters with nice 1950s styling. Collectors Weekly: What are the differences between American and European-made typewriters? Polt: Despite that one early Danish machine, the typewriter industry really got started in America for the most part, and Europe came on the scene late. A lot of their designs were borrowed from American designs or imitated American designs. But then they developed quite a big industry, especially in Germany. There are a lot of German-made typewriters, and they tend to be quite well engineered. Olympia is a favorite with people who actually use typewriters because they’re just really well made precision machines. Collectors Weekly: What determines if a typewriter is well made? Polt: Like with cars, you talk about fit and finish. With typewriters, you can tell if things are precise or smooth, if they fit together well. That’s hard to achieve because they typically have several thousand parts and are under quite a bit of stress. So it’s pretty difficult engineering to get them to really work well together. And then there are questions of feel. Some typewriters are not very responsive. You have to push down hard on the keys, and you get a dull response. And with others you just flick the key and they’ll type really quickly with a very satisfying snap. That all depends on the design of the levers in the mechanism. Collectors Weekly: What are some of the basic parts of the typewriter? Polt: There’s the keyboard, and the carriage, which is the part that moves back and forth as you write. Then the platen, which is the rubber roller that’s in the carriage – the paper is between the platen and the type. And the ribbon mechanism. Then you have the carriage return lever to return the carriage over to the right after every line. Those would probably be the essentials. Most people don’t know what to call the type bars; they call them the keys. But the keys, that’s what you hit with your fingers on the keyboard, and the type bar is what goes up to actually type. In terms of typewriter repairs, with some experience, you can do most of the things you need to do at home with some simple tools. You might need to fix a broken pull cord, which connects to the main spring and pulls the carriage along as you type. Often that is broken or is damaged in some way. Or the machine might be out of alignment, so you might have to individually bend the type bars to get them to type straight. And there are a lot of little other things that can go wrong. Polt: There are electronic typewriters that use daisy wheels that are made by Smith Corona and Brother and I think some other companies, and some manual typewriters still made in India and China. I don’t expect that that’s going to last much longer. Electrification was one major innovation in typewriters. There were designs for electric typewriters in the 19th century, and in 1902 Blickensderfer came out with an electric, but it was ahead of its time and it failed. So electric typewriters didn’t really become widespread until the ‘50s. With most electric typewriters, there’s a cylinder that is constantly spinning inside the typewriter when it’s turned on. When you push down the key, the cylinder will catch on a type bar and make it type. So you just have to touch the key very lightly and then that produces an easy and really quick impression, so it’s less tiring on your hands. 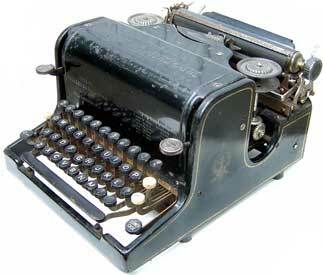 The Selectric, which I mentioned before, was another big innovation, and the daisy wheel eventually. That’s where all the characters are on this thing shaped like a daisy, which is interchangeable and spins around to type the right character. Those are electronic typewriters, so they have some electronic circuits and usually some memory. Some of them are simple word processors where you can type a line in a little screen before you actually print it. Those came out in the ‘80s, and then basically they became obsolete due to computers. Throughout the 1980s, the typewriter industry was crashing. Collectors Weekly: When collecting typewriters, what are some key things to look for? Polt: You have to educate yourself so you can recognize when something is worth a second look. There are several good books on the topic, which I list on my website. Probably the most complete book in English is Antique Typewriters by Michael Adler, and that has some price estimates, too, which give you a rough idea. When a machine is not rare, condition becomes more important, so you should hold out for a typewriter that works, that doesn’t have rust, that doesn’t have damage to the paint. It takes a while before you have enough knowledge of the field to be able to tell what’s unusual and what’s not. It’s also useful just to look on eBay and see what’s being offered. Collectors Weekly: Are there a lot of typewriter collectors out there? Polt: Not really. I edit a magazine for typewriter collectors called ETCetera, and our mailing list is under 200 people right now. They’re mostly in the U.S. In Germany there’s probably an equal number of people. That’s probably the country with the most typewriter collectors per capita, because a lot of them were made there and because Germans love technical things. There are also collectors’ associations in France and Italy, and a number of collectors in Spain and England and other places around the world. The Internet has made it much easier to keep in touch. Because of the small number of collectors, it’s an area where unless you’re looking for really rare things, it’s not expensive to build up an interesting collection. And you get to know the people in the field pretty quickly. Most of them are friendly and will help each other with parts or information or pictures. Another thing typewriter collectors often collect is ribbon tins – there are thousands or hundreds of kinds of ribbon tins out there. It’s a cylindrical tin usually about three quarters of an inch high that would contain a metal spool with the typewriter ribbon wound onto it. One recently sold on eBay for $1,000, so they can be valuable. Collectors Weekly: Where do you do most of your research on typewriters? Polt: A combination of books and online and asking friends. There’s also a couple of e-mail lists on Yahoo! Groups that are really useful. One is called Typewriters, and it has 950 members. The other major group online is called the Portable Typewriter Forum, which also has about 900 members, and that was started by Will Davis. In terms of clubs, ETCetera, which I publish, is for members of the Early Typewriter Collectors Association, and that’s an international association, although most members are in the U.S. In terms of books, on my website there’s an area called the Percy Smock Corner, and I would say the most useful books listed on that page are Adler, Antique Typewriters: From Creed to QWERTY and Rehr, Antique Typewriters & Office Collectibles. Those two are probably a really good place to start. There are enough people who are obsessed with typewriters that there’s a good number of things in print. The most complete book of all is by Ernst Martin, a German book from the 1940s. So for those who read German and can find a copy of that, that’s probably the single best one. It’s just obsessively complete. Collectors Weekly: In terms of your own collecting, what do you look for? Polt: I have a ten most wanted typewriters list on my site. It’s hard to say why. They just grab me. I put it together over 10 years ago, and I’ve found three of them. A couple of them are very obscure even to collectors, and others are very famous like the Sholes & Glidden. I do enjoy using my typewriters. I keep one by my desk, and I use it for filling out forms or envelopes or labels, and writing short letters sometimes. Or sometimes when I’m writing something a little more serious, I turn off the computer and do the first draft on the typewriter. I’m too distracted when I work on the computer, I can’t help checking my e-mail. Sometimes when I’m writing something a little more serious, I turn off the computer and do the first draft on the typewriter. A significant minority of writers, especially young writers, are turning to typewriters because of the distraction factor. There’s only one thing you can do on a typewriter, which is write, and there are no distractions from other programs or the Internet or all the formatting issues that the processing software gives you. Or they just like the romance of it or the sound of it or the feel of it. People are starting to notice typewriters more. More information is available. There’s a retro appeal now. There are movies with typewriters in them. There’s a very nice film called Starting Out in the Evening about an old novelist who works on the manual typewriter, which is essential to his role in the movie. Or The Lives of Others, a movie about East Germany – typewriters had a prominent role in that. Kids are often fascinated with typewriters because they’ve never seen one before. I’ve given a number of typewriters to my eight-year-old daughter and her friends, and I just donated one to her school. So a new generation may have some interest in them. The people who want to use typewriters for writing or just out of love of novelty, they’re a new kind of collector, not really looking at them as antiques, but as something they just want to have around, as neat old tools. Some records have been set in the last few years for very rare typewriters. I would say the most valuable single model is that Writing Ball that I mentioned, the first commercially produced typewriter. That can bring $100,000. Typewriters are also getting more valuable because they’re not making any more of them and some of them are being destroyed by people who cut off the keys and use them for jewelry. They make bracelets and cufflinks and that kind of stuff. Usually they’re destroying typewriters that are very common and collectors probably didn’t want anyway, but most of us cringe when we see it. And sometimes they do cut up a rare model. I found a typewriter on eBay that had its keys cut off, and it was a typewriter with a name that I’ve never seen before and I haven’t seen since. I bought it and reattached the keys, but it’ll never be the same. This cutting up trend started maybe eight years ago. It’s become the “cool-looking” thing I guess. I’ve also seen some binder clips and other office supplies that are made with reproduction typewriter keys on them for decoration. Collectors Weekly: Any final thoughts about typewriter collecting? Polt: Just that to me it’s a much more fun hobby than collecting stamps because even though stamps are much easier to collect or to store, there’s a lot more you can do with a typewriter. You can take it apart, you can fix it, you can clean it. You can compare notes with owners of similar machines and compare the differences. And then you can actually use it to write something! Great interview. Kudos to Richard Polt for making typewriters more interesting and accessible to all of us. FROM ALL I COULD FIND ON PICTURES IT IS A #4 AND POSSIBLY WAS MADE AROUND 1918-22. I’m very impressed by your article and interest of collecting old typewriters. I have ‘inherited’ 6 old machines of varying makers from my husband’s grandfather. ‘One’ of his wives had owned a typewriter (and later computer) business in Washington, D.C. many years ago. I think they saved some of their favorites. Your article provided me with much information that I hope to use in trying to decipher just how much they may be worth. Neither my husband or myself are interested in ‘collecting’ these machines, though they do look pretty neat. I’d like to eventually just unload all of them at once… once I do a little homework. The books you referenced will be my next stop. This article was my first attempt at finding out information. I think I hit a gold mine! Thank you so much for doing this interview. It has been very helpful. If you are interested in knowing which types I have on hand, feel free to email me. Thanks! We have a very old Oliver typewriter in our possession. We are wondering what the value of it would be today if we were to sell it. This typewriter is in excellent condition and still in working order. Not chipped, rusted, etc. Thanks. I have an American 2 1893 which has the label “American Manufacturing Co.” on it. The rubber letters are missing. What else should I look for as far as condition? What is the approximate value of this typewriter? Your article was very informative and interesting. Thanks. Looking for the production date and any value for a Smith-Corona portable typewriter (serial # 1040319). In excellent condition,maroon in black case. I have recovered a Royal portable typewriter from my attic, whenever the carriage is pushed to the right is just slides back. I do not see any damage to the typewriter, and was wondering if you can help as to why the carriage does not stay to the right? p.s. 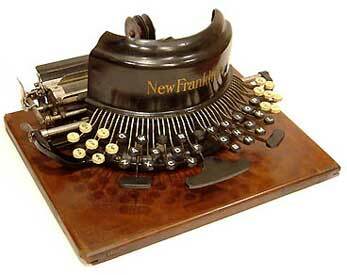 The Franklin typewriter looks fantastic! I have a 1989 Adler electric 21f in mint condition with cover. i still have it same ribbon on it when it was first made. 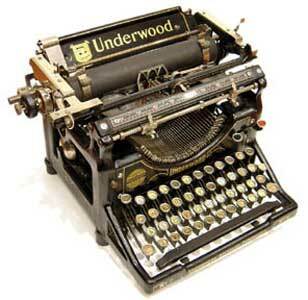 I am trying to find a date of manufactor on a #1887999-5 Underwood Standard Typewriter. How do I find it? My dad gave me an L.C. Smith and a Royal stored in his garage for many years. They are very dusty and the return on the Smith is stuck. The return on the Royal too easily slides to and fro. How should I clean them and give the TLC needed? I have a Brothers cassette Electric L10 Plus 3 portable with case. It is all metal. Has not been used for many years but still in perfect working condition. Thanks so much for sharing your passion and expertise! Hi Richard, Bonjour depuis la France. Je sais que vous comprenez le français! Je suis toujours abonné à ETCetera. Mon rêve est de trouver une Crandall3 pour tenir compagnie à ma Sholes et Glidden. Happy New Year et bonne santé. Amitiés. Dear Tom Hanks: Have We Got a Typewriter for You! “ ” The Serbs would just let themselves go and feel totally immersed and totally ecstatic about the music.